I’ve never, ever been a Corvette guy. Expensive sports cars have always taken a back seat to rusty old trucks and full-size GM cars of the 1960s. 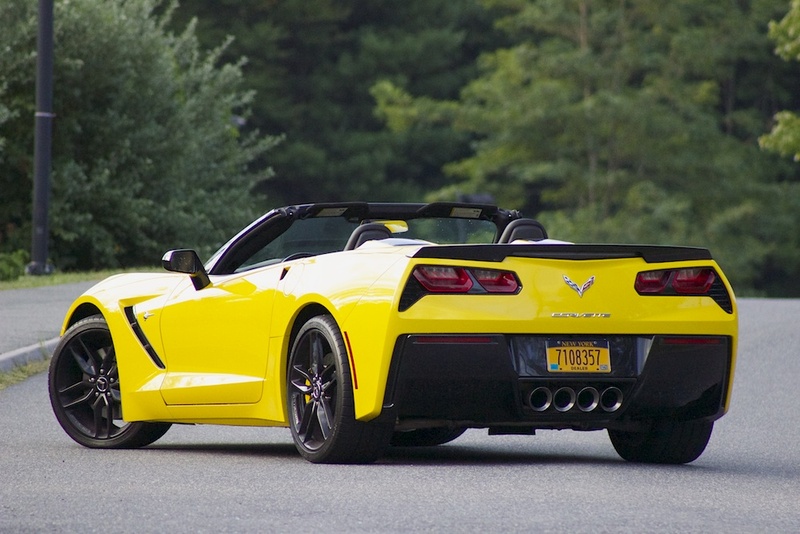 The 2014 Corvette Stingray Convertible completely turned me around, though. It’s the kind of brutally fast, flag-wavingly American car that the Corvette always should have been and — amazingly — it’s a bargain. My first experience with the Corvette was this: I fired it up, rolled it down to the end of my street and got it straightened out on the main road and gave it the beans in second gear. At 25 miles an hour in TOURING MODE, it absolutely boiled the hides until the traction control reined it in. That’s an eye-opener unlike any cup of coffee I’ve ever ingested. It’s not like you couldn’t get substantial horsepower out of a C6. 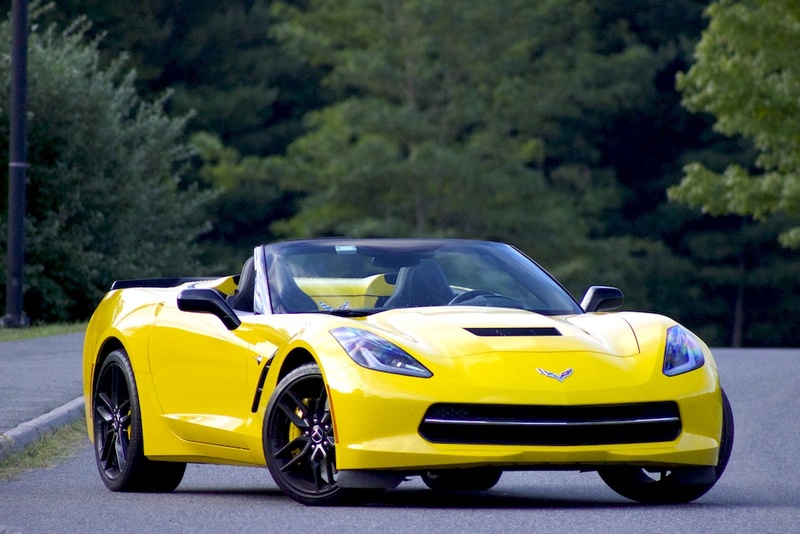 The 2005 to 2013 Corvette offered 400 barely contained horsepower, too, and it was moving a pretty nice looking car. But the C7 feels as different as the 2014 Camaro feels from a 1996. 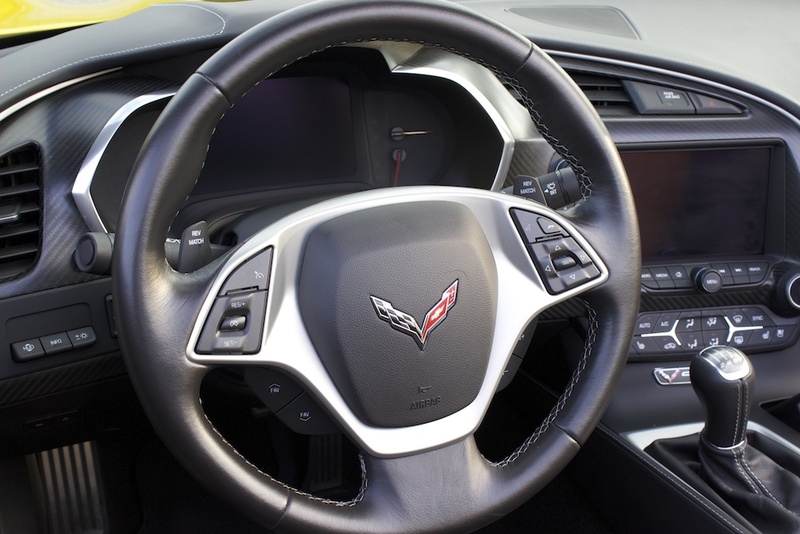 The Corvette features four driver-selectable modes, and Touring is its natural setting. For some ungodly reason, if you wanted to dull the car’s throttle response and make it feel like a Malibu, there’s an ECO mode. I’m assuming it’s there only to serve the interests of Corporate Average Fuel Economy, and it will get used about as often as the dusty buttons on your universal remote. The Weather mode “promotes more confident driving in rain or snow.” I didn’t see either in my driving time, but I’m imagining driving the Corvette in the snow offers all the confidence of walking around with a grenade in your pocket. Chevrolet, if you’re listening, throw a set of snow tires on one and send it up here to New England this winter. I’m truly interested in how it performs. Touring is nice when you’re driving around trying not to attract attention. I took the Mass Pike out to Worcester on a beautiful, late summer evening with the top down and wasn’t in any rush, so I tooled along in Touring mode at 70 miles an hour. It wasn’t until I exited the highway that I realized I was in fifth gear, rather than seventh. The engine was still barely turning. The action starts happening in Sport mode, which tightens everything up a bit. The steering gets a little heavier and the optional magnetic ride control stiffens the response to the pavement. The exhaust opens up a little bit, too. Track mode offers increasing levels of insanity. Launch control lets you mash the gas to the mat and side-step the clutch for consistent takeoff, every single time. 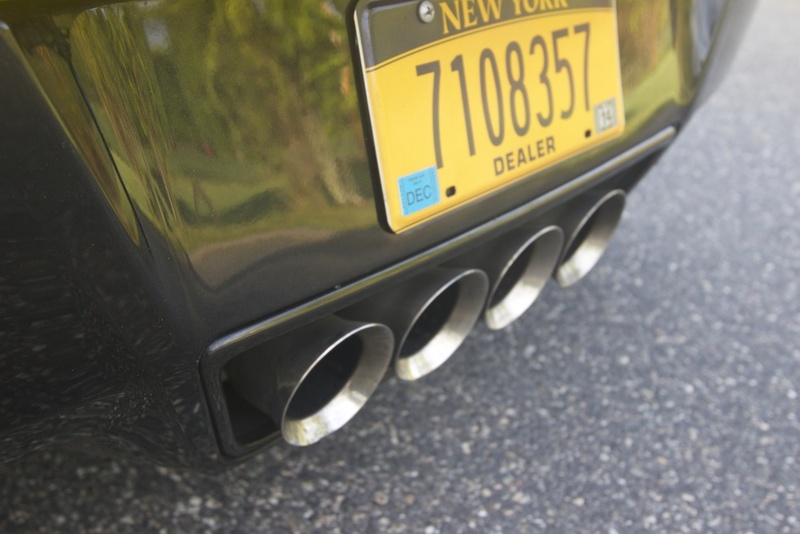 The exhaust goes from burbly and pleasant to raucous and loud. Performance Traction Management — part of that $1,795 package that includes Magnetic Ride Control — only activates in Track mode, and with two quick presses on the traction control button. With PTM on, you’ve got another five modes of track-oriented performance modes to select: WET, DRY, SPORT 1, SPORT 2 and RACE. 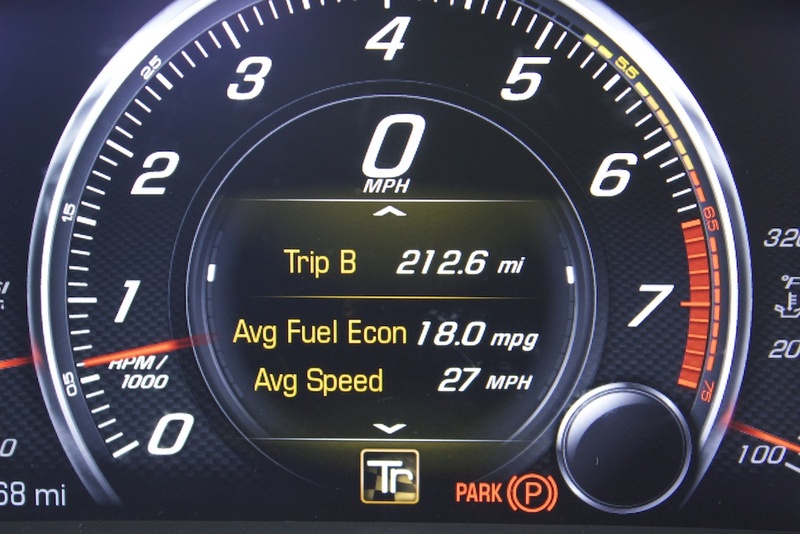 Each mode offers less and less intrusion from the Corvette’s traction management system, until you’re really out there on the track by yourself with only your own driving skills to rely upon. 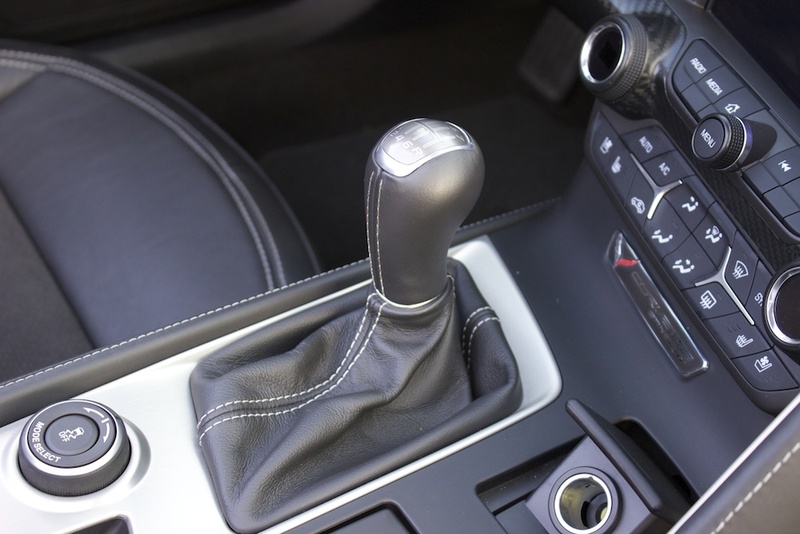 Another nice feature with the seven-speed manual is the Rev Match function. 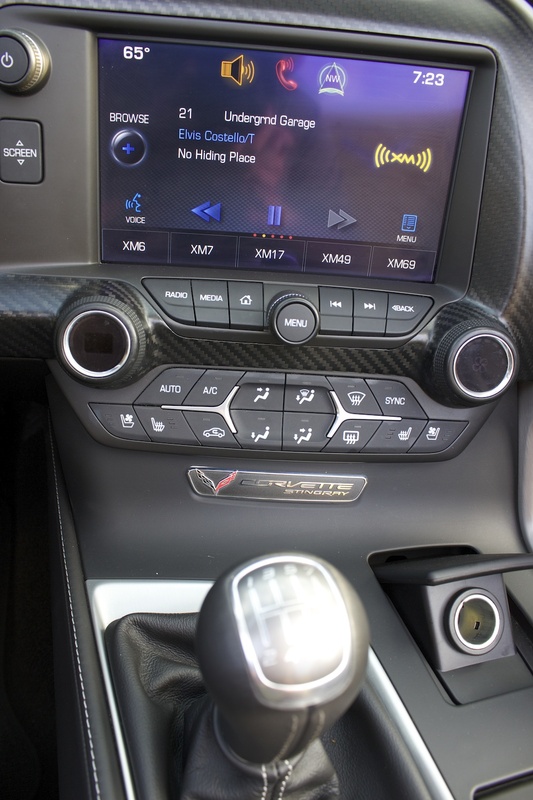 Where shift paddles are located in a Corvette Stingray with an automatic are the paddles to engage Rev Match. Pull either one back to engage it, and suddenly, you sound like Jackie Stewart downshifting into every corner. If you’re like me and never mastered the art of heel-and-toe shifting, it’s pretty cool. Our tested Corvette Stingray Convertible came with the $8,005 Preferred Equipment Group (3LT) that offers a ton of equipment from a double-stitched, leather covered dash to the Napa leather seat inserts. 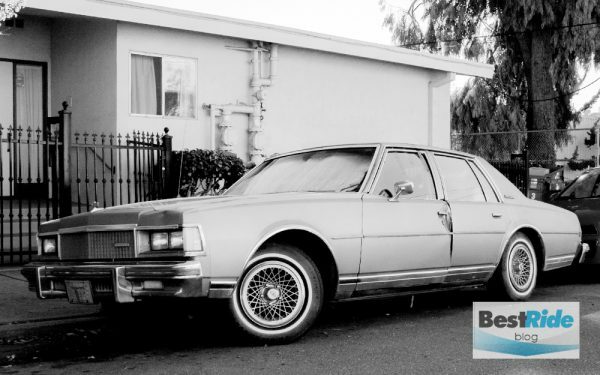 For eight grand, you’d expect a lot and you get it, and you don’t sacrifice any creature comforts if you’re moving into this car from a Cadillac. But it’s all luxury equipment. You’re not getting anything here that improves performance at all. If you can live with the standard seats and a nine-speaker Bose audio system, versus the 10 speaker premium Bose setup with surround, you’ll save enough to buy yourself a pretty nice motorcycle. Styling is about as subjective as you can get, but this is the best-looking Corvette since the earliest third-generation cars. That paintbrush, Bill Mitchell profile is there, and from the driver’s seat you get those two wheel arch bulges on either side of the hood that really make it look like you’re driving a car from the 1970s. Yet, it’s not a throwback car like a Mustang or a Camaro, at all. It’s completely contemporary, without looking like an angry insect. 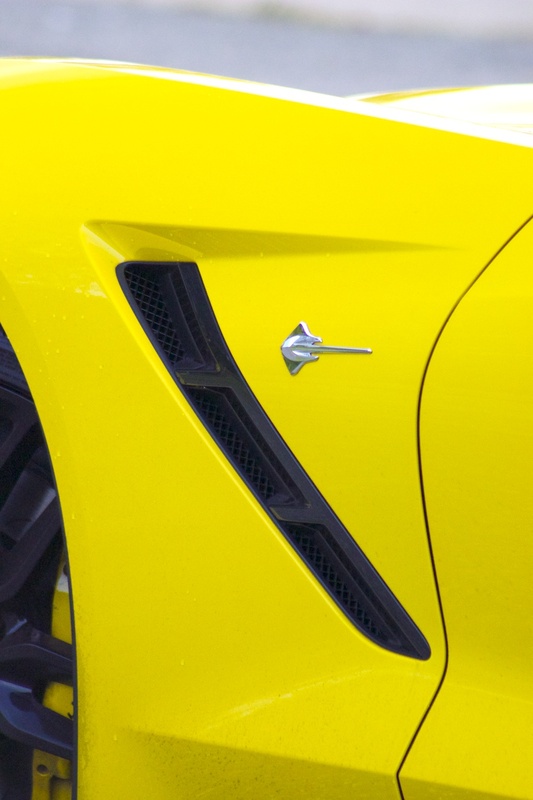 I like yellow a lot, but bright colors really accentuate all the black vents and scoops this car’s equipped with. I have no problem with those, because every one is functional, but I’d also rather not see how the plumbing works in a new house. There was a Corvette coupe around earlier this year in Lime Rock Green that perfectly hid all the mechanicals, but offered a bit of color versus just choosing black. Unfortunately, it looks like that color is no more. Second, I just got out of the Jaguar F-Type. This is a solely aesthetic point that has nothing to do with performance, but everyone wanted a better look at the F-Type. 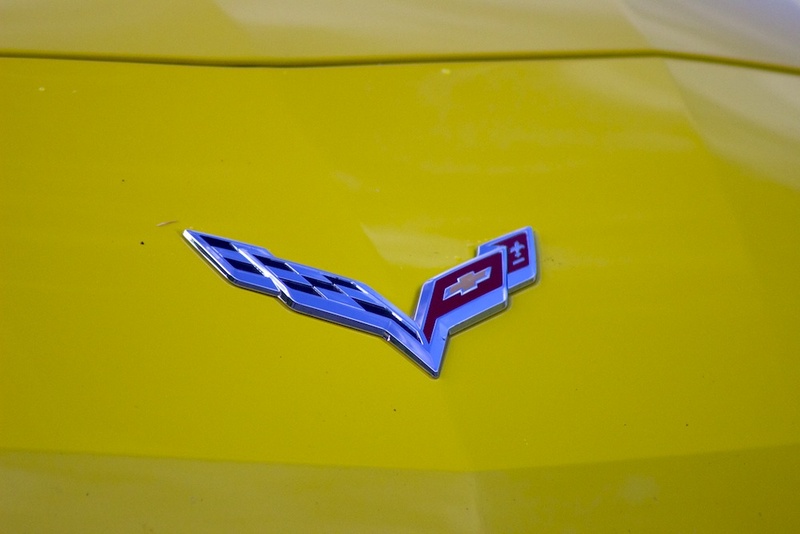 The Corvette Stingray, even in Velocity Yellow, barely got a second look. I think it’s a gorgeous automobile, but if you enjoy the attention of every human with an ounce of passion for automobiles, the Jaguar beats it, hands down. 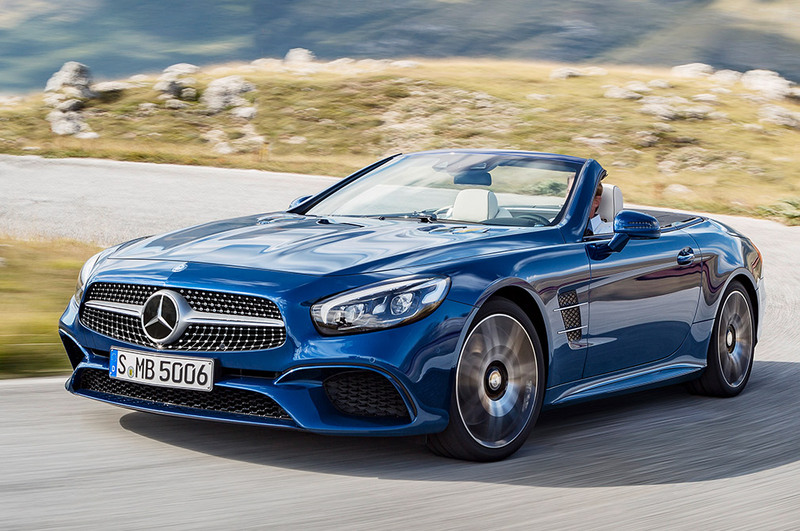 Finally, this is my cheapskate heritage talking, but the final sticker is $74,365. Eight thousand dollar option packages aren’t nearly as attractive as the fact that you can buy a coupe with every one of this car’s 455 horses for $54,000 and still have the benefit of an open-air cockpit with the standard removable roof panel. Look at anything with a Porsche crest on it for anywhere near that price and you’re driving a stripped Boxster or something from the used side of the lot. That’s key to this car, and what’s completely turned me around to become an enthusiastic Corvette Stingray supporter: All this thoughtful design and amazing performance is available at a price that anybody with a halfway decent paycheck can afford. Out of everything I like about this car, Chevrolet’s egalitarian approach to getting it out there is its most admirable trait. Man – I was afraid you’d love it and write a glowing review. The Stingray was at the top of my list with no contenders for a 2015 purchase until I began to think about the limitations that this two-seater brings to the party. I began to look at alternatives and my search led me to the Porsche Macan. Sporty enough for my needs, four doors in a small crossover, 340 hp, capable of towing several thousand pounds – spec’d to my needs is… $56,000. Plus, we can do a Euro-delivery and squeeze a good vacation out of the purchase. Realistically, who will tow several thousand pounds with it? Wrong tool for the job but I can use it for my kayak trailer – about 250 pounds loaded. I hope you get your hands on a Macan – interested in your opinion.